I have several addictions, or as I like to call them, collections. ABC/alphabet items seem to top my list. Once again, I blame it on the teacher in me, but I have a really hard time passing up anything alphabet-related. I've decided it's a really good thing we're having another little one, because my twins will be 8 in a few months, and they really don't need any ABC decorations, and my almost-five-year-old really has out-grown all this stuff as well. So, thank goodness for baby boy number 4! I can keep my collections around for a bit longer. I posted this project early on in my blogging career, and it's still one of my very favorite projects! I found a picture of something similar to this in blogland, and wanted to recreate it. I was worried about how mine would turn out, but I LOVED it! Just looking at it now, I still love it! In fact, it makes me want to make a newer version with a new color scheme. 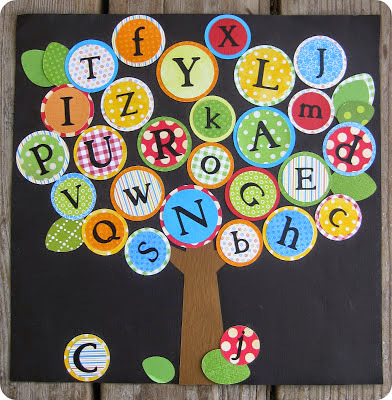 Click here for my entire post on the DIY ABC tree. This is the perfect project for all those scrapbook paper scraps you have hanging around.